Your customers are going to love making a plan with this year on a page calendar. It's a single sheet measuring 23" x 35", printed on 100 lb. matte stock, and is available in any two of our standard PMS colors. This features easy-to-read figures and American holidays and Sundays printed in a different color for quick and easy recognition. This has a daily memo space, is tinned at the top and bottom, and is packed flat. Use our print method to add your custom name or logo with one of 23 standard imprint colors at no additional cost. Be a daily part of your customers' lives with this great item. 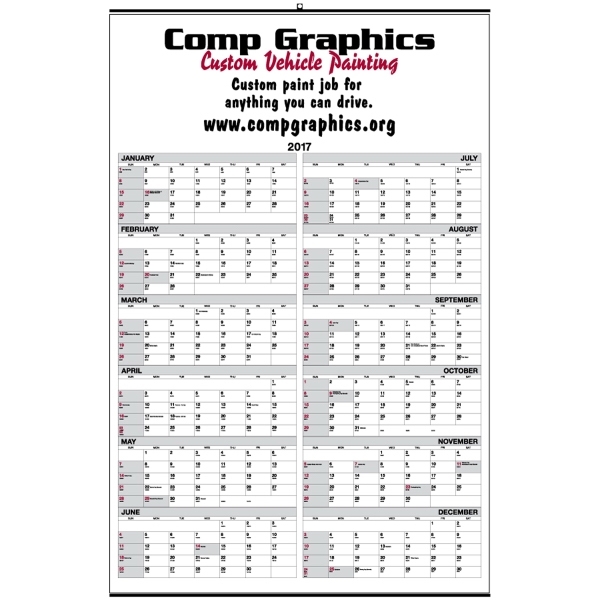 Size: 23 " x 35 "
Imprint Size:22" x 6 1/4"
Custom or special order colors are an extra cost. Call for pricing.